Take a trip to the picturesque islands. Craving a trip to the Caribbean? The Turks and Caicos Islands have everything to offer for families. And, the chain is easily accessible for broods with even the tiniest of tots. If your babe is cleared to fly, then try one of two easy ways to vacation. Start planning your family vacation at www.turksandcaicostourism.com. With three-hour direct flights from the tri-state area to Providenciales International Airport, you could be swimming in turquoise waters in less time than it would take you to complete a Netflix marathon! Whether you have an extended holiday weekend to spare or a more flexible schedule, you can cater a Turks and Caicos trip to fit your itinerary. Those who prefer to hop on a plane with minimal planning may look to an all-inclusive resort for luxury, leisure, and lots of adventure. Beaches Turks & Caicos Resort Villages & Spa has outstanding amenities at the new Key West Luxury Village in Providenciales. It offers suites and villas with private pools that can accommodate as many eight people at a time. Large families and groups have great options; share a living space with grandma and grandpa but sleep in separate rooms. The resort's Pirates Island Waterpark — with multiple slides, a lazy river, a surf simulator, and various water-spraying devices — is a sure selling point for youngsters and the young at heart. Kids and teens can also cool off in the Xbox Play Lounge. If you need some quality couple's time, Kids Camps for infants through children age 12 provide endless (supervised) entertainment and the chance to make new friends. Little ones will especially love all of the available activities, shows, and parades starring their favorite Sesame Street characters. Plus, pre-teens and teens have their own exclusive programs. The foodies (or picky eaters) in your crew will find mouthwatering dishes and endless desserts at 19 available restaurants, featuring everything from Italian and French flavors to Mediterranean and Caribbean cuisine. Everyone can relax in the property's various and scenic pools, with swim-up soda and regular bars, or mom and dad can treat themselves to a spa day. You're not going to lack options for adventure, either. The Key West Luxury Village facilitates all sorts of activities and excursions, too. Take a quick walk to fine sand beaches and epic seascapes right near your room to participate in water sports like scuba diving (swimmers as young as age 8 may get certified), snorkeling, kayaking, sailing, and paddle boarding. Another short plane ride, this time to Florida, will take you to a port where you can set sail for Turks and Caicos. Carnival Cruise Lines and Princess Cruises both drop anchor at the destination as part of their tours. Cruises allow for all-inclusive indulgence, too. You'll venture toward crystal clear waters while relaxing in the equivalent of a floating hotel. Aside from eating as often as possible, shopping, lounging poolside, and taking in a variety of familyfriendly shows and performances, you'll also find kid-centric programs and activities to entertain tiny travelers — all before you even make it back to shore! Once you do arrive at Grand Turk, discover myriad options for beach exploration, snorkeling, kayaking, diving, sailing, touring historic landmarks and the Turks & Caicos National Museum, and souvenir browsing. Depending on the chosen itinerary and cruise duration, you may experience other ports of call in the Bahamas, U.S. Virgin Islands, Aruba, and Puerto Rico. 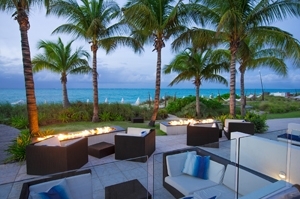 However you get there, Turks and Caicos will certainly be a crowd pleaser. Safe travels!